George Saunders’ memorial the summer after his passing…when his kids were in town and the weather was bright and the day perfect for scattering his remains. Dear Francy; My dear Great Aunt has just passed…mother wants a big funeral..I want a quiet family memorial. What can I do? 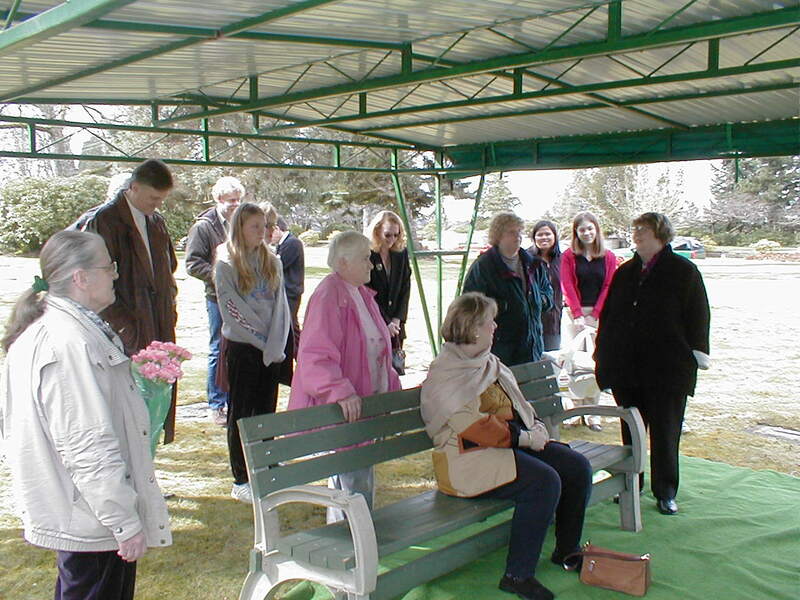 The times are changing and more and more families are having quiet and special memorial gatherings for their elders. When people have been unwell for a long time…and are of advanced age memorial gatherings seem to fit the bill in today’s world. Although funerals are still a wonderful way to honor those that pass…we have found that it works best when a person has passed in their prime with lots of friends,neighbors, children, siblings or even their parents alive to attend. In contrast an elder that has lived long and has been unwell for quite some time…maybe aged out of their large group of friends and maybe have no friends left alive has different needs for their memorial. For those that have outlived most of their own family and those around them that would honor them…a smaller memorial has a new appeal. There is a larger and larger amount of seniors that are now choosing cremation and their remains have to be honored. Some of them want to be buried by their spouse or family members…some have no one left to be buried next to…so they choose to have their ashes spread in a place that has a meaning to them. A perfect example of this was when my own father died and my mother had a very large formal funeral and burial for him. He was 62 in a time of his life that he was still working with loads of friends, business associates, family and a healthy wife. He was in the furniture business so mother paid for an expensive, carved wooden coffin and had the full services of minister, open casket, singing, and service. I remember it all well…it was a very hard thing for me to get through really…with the sting of his death so new and the pageantry of the formal funeral so close behind his passing. No extra charge for a simple grave side memorial for family members. So, it was with great shock that 40 years later… when my mother was asked about her personal wishes for her own funeral she refused the idea. “I don’t want a funeral. If you want to say some prayers over me when they bury me…that will be plenty for me.” WHY? I was shocked…the memory of my dad’s burial so clear in my mind. Mother told me, at the ripe old age of 100 years, she was without all of her dear friends. She only had one brother left, who was in a nursing home and her children were older with grand children of their own. She just wanted a quiet, inexpensive burial…nothing fancy. She would share the double size head stone with dad and she would be just fine. I was very pleased…so when she died we met together at her grave and said our goodbyes. 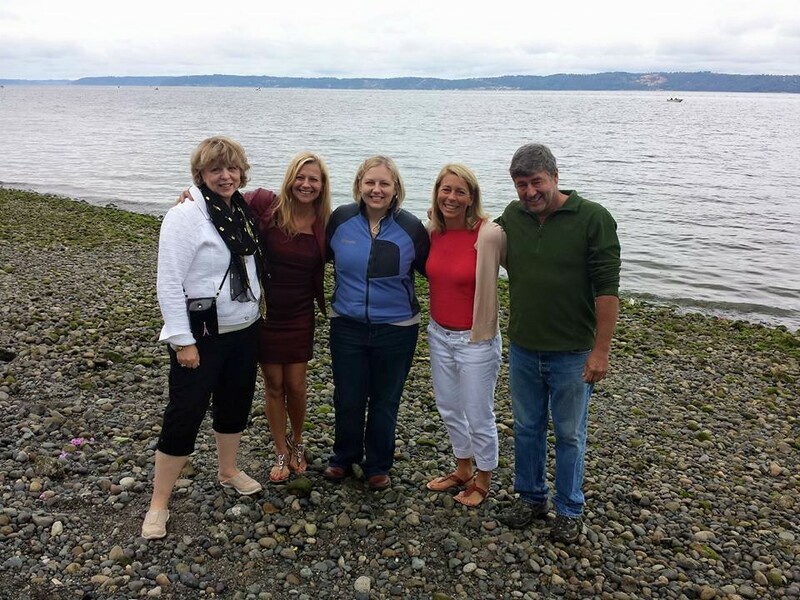 Then the next summer….we all got together in the her favorite park on the Puget Sound and had a wonderful picnic in her name and threw flowers in the water with all her grand, great grand and children together. She would have been so happy to see us together having good times. Passing is hard for those that are left behind…so I ask that you talk to your senior about their own idea of what they want for memorials. Some people plant trees or bushes, some buy bricks on a memory wall at their local charity, some have legacy money that goes on to honor them in an organization that they enjoyed. So, when my Georgie passed what to do? I had given him non stop 24 hour care for months and I was seriously exhausted and close to illness myself. I knew George did not want a funeral and the day I picked up his ashes I went into tears and had to wait in that parking lot for 45 minutes till I could get myself under control to drive home. The darkness of November was overwhelming. George’s children were all busy people, three of them and grand children lived out-of-state. So I made a decision to prolong his memorial to the next summer. Lately, many of my fellow caregiver spouses have done the same. Prolonging the memorials for their loved ones and holding the memorials in places and times that reflect the personality and family members’ needs – and the person that has passed. A sweet gnome church was placed as a greeting for guests at the memorial. My dear friend, lives on the water and had worked hours on getting her home ready for the memorial for her husband. Cleaning, painting, and working in the garden to brighten and clean it all up from the neglect the winter of sadness and illness had been left undone.Working through her own grief by keeping busy and putting her life in good order. Now, she has the place all in order, clean, up dated and ready for her friends to be invited to an event that can be filled with love, warm friendship, honoring and enjoyment of her dear, passed spouse. During the clean up she even came across a sweet little church her hubby had made by hand. 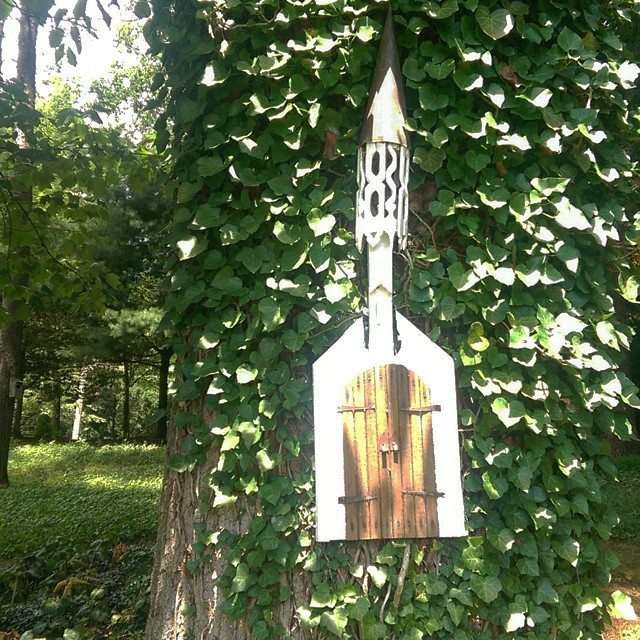 She re-painted it and placed it on a tree for the guests to enjoy when they entered the garden and lovely home. The sadness of the immediate passing had been worked through and the gathering a few months later allowed everyone to think over their memories and express their feelings with each other. Choosing a place and time for the memorial that fits the family and the person that has passed makes the event very special. A Celebration of Life for the loved one that has passed. Even younger members of the family can participate in the memorial. Maybe a guitar and song from a grandson…a small dance from a young grand-daughter, or a reading of a poem or story from daughters and sons. For us it was my Georgie’s children singing “Oklahoma” a song that the family all sang together on road trips. Or a collection of the elder’s hobbies or a board full of pictures that show the movement of young to the older pictures of the elder for all to view that special life journey. Handing out something for each attendee to enjoy is always special. One gal had her husband’s picture put on YoYo’s and had a contest…that cracked me up. I like making book marks on your computer and topping them with a small ribbon…with a special Quote from the honoree on the back. Or asking your Grand daughter/son to do a small brochure fact sheet w pictures, birth and death places and dates to share with everyone. The rules of these memorials are yours to make. Balloons to release, flowers to throw into the sea, cookies wrapped up with a note on each to take home. There are wonderful photo charms, craft projects with the name of the elder on a poured stepping stone for the garden. Small Christmas tree ornaments with a picture of remembrance for the tree at the holidays…or tee shirts with Grandpa and all the grandkids’ picture on the front 😉 Your creative side can find something sweet to share with all. Making the memorial as complicated or simple is up to you…but doing it with the knowledge that even long after the death…the emotions are still strong and making the gathering a memory…not a chore. 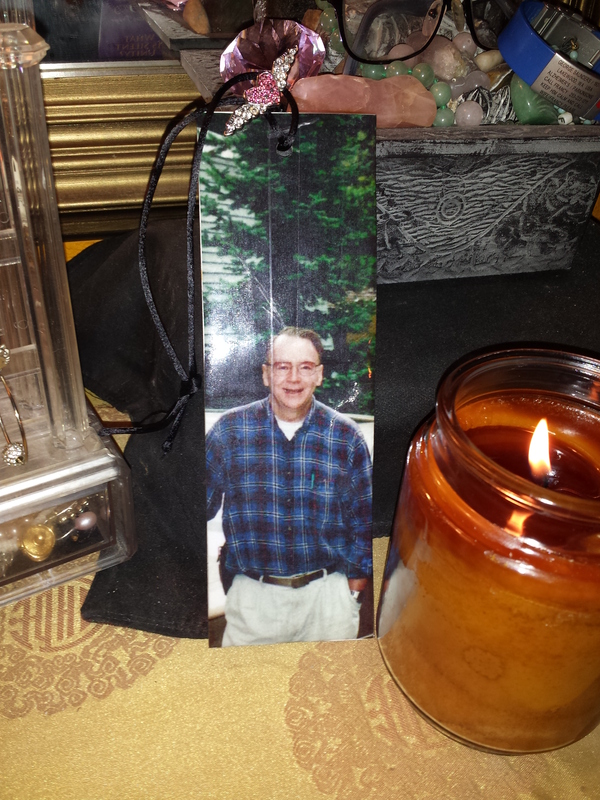 Being together with family and friends…each sharing their memories of the loved one is powerful stuff. Inviting a person to represent their faith or appointing a family member to be the spiritual point person is also important. Some times the simple moments of togetherness…is what is remembered and appreciated. The event does not have to be big or expensive…it can be small and sweet. Just know that there are choices to be made…and an immediate, expensive funeral, burial, and large event is one way to memorialize the elder…and a relaxed time frame that may be even months or a year after the death is another. A simple gathering of a few friends to wish the elder blessings on their way…is another. No rules…no right or wrong…just in love – you give your care giving and your bon voyage to a dear life partner or friend. I thank you all for giving care to your loved seniors…this process of saying “Good bye” can be a choice of your own. Remember…there are no rules…you do what makes you and your family feel is right for you! That is how your elder would want their leave…to be done with love and ease. 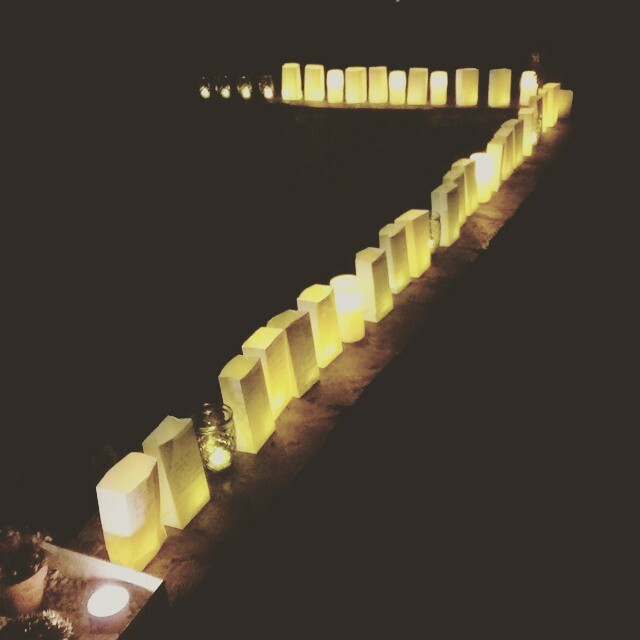 Luminaries to follow the path…each representing the love that is felt for the elder that is being memorialized.